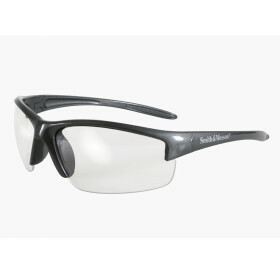 S&W Equalizer Sunglasses » Protective Solutions, Inc. The Smith & Wesson Equalizer Sunglasses are stylized frames that feature a cutting edge design that is ideal for work and play. The sunglasses feature a sport grip temples, soft rubber nose pad for superior comfort and grip, wrap around anti-fog lenses. And these sunglasses exceed the "high impact" level of Ansi Z87.1+ Safety Standards and also have a 99.9% UV protection. Available in metallic gray with clear lenses.